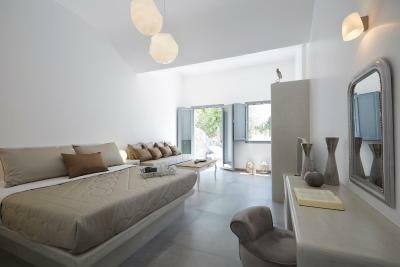 Lock in a great price for Amara Suites Santorini – rated 9.6 by recent guests! 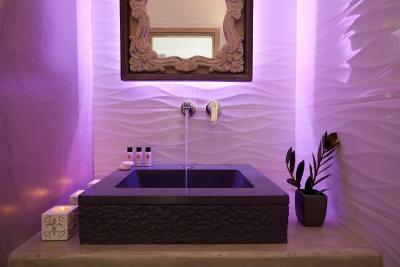 We loved the location, the room was spacious and amazing with our jacuzzi. We had an amazing breakfast then relaxed in the jacuzzi and got some sun before exploring the island. We will be back. Dimitris is a wonderful person and he made us feel like family. He greeted us when we arrived and gave us fruit, a card, and Prosecco to celebrate our anniversary! Where shall I start? 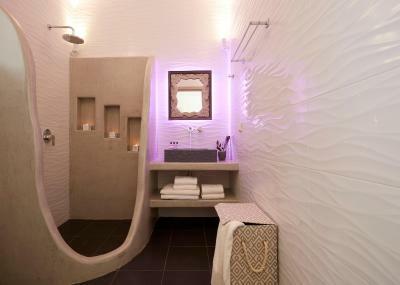 Amara suites is what you call a proper luxury boutique hotel. 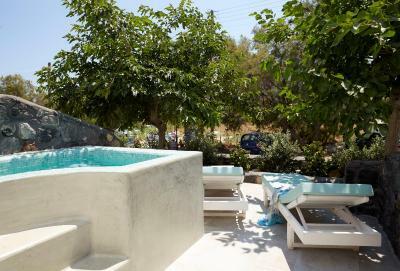 The property has only 3 rooms where you are welcomed by your name and where you get a hand check from Dimitrios (the owner) on your arrival. 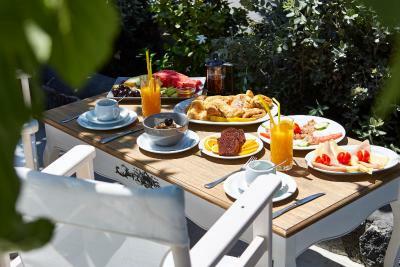 At Amara you will get a very copious breakfast which is served at Dimitrios’ restaurant by the beach. The room itself is very spacious and extremely clean thanks to Maria. 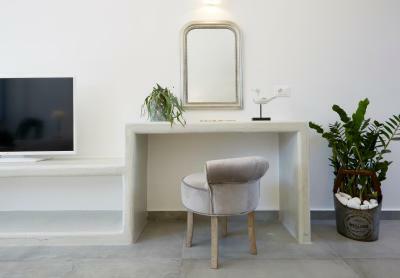 I highly recommend Amara if you are looking for a place to stay at in Santorini but in the meantime want to feel like you are at home. Thanks to Dimitri and staff for making our trip to Santorini extraordinary . We felt really like home. Thanks alot again. Where do I start? I don't normally write such gushing reviews like this! Amazing suites, with hot tub and private sunbeds, cleanest hotel room I've stayed in for years. Excellent facilities & Wi-Fi with the friendliest, most welcoming staff & owner. They could not do enough for you! Well stocked fridge, free big bottles of water, helping out with bookings & recommendations. Huge, fantastic breakfasts at their family restaurant (Great for dinner also), Yes, its a 5 min walk from the suites for breakfast, but what a lovely walk along the beachfront. Location is great, with free parking & another great 'plate smashing restaurant next door and next to that a supermarket for extra supplies. e.g. Prosecco for drinking while in the hot tub! Compared to another more expensive hotel on the west coast of Santorini that we also stayed at, this was far superior and an overall fabulous experience. Will definitely be back. Yammas Dimitris. As soon as we arrived, Dimitri made us feel at home at the property. The staff was super friendly and made the accommodation feel more homely than a hotel. The breakfast every morning at the Family Tavern (and all other meals) was amazing. While Fira and Oia were beautiful locations, Kamari had loads of culture and was less crowded. It was exactly the relaxing location we needed and was not far from the other towns. The hotel was also a 3 minute walk to th beach. The rooms were cleaned spectacularly and Dimitri was super helpful in helping us navigate Santorini. The room was beautiful. And we had Netflix on the tv. Not sure what else you could ask for. Definitely staying here again next time I'm in Santorini. Great place , with excellent hospitality . 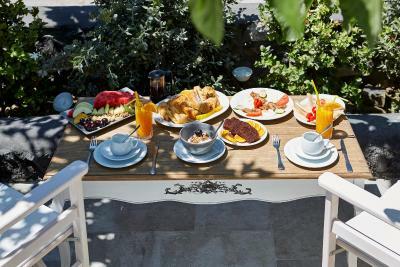 Very good breakfast , and super service. 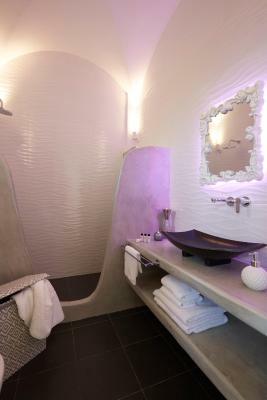 relaxing in the private Spa is unique and give a superb feeling. Everyday clean and fresh towels and a 3 minutes walk to the beach, makes is complete . Comfortable, brand new, quiet, elegant, super clean. Dimitri is a perfect host and he made us feel home since the very first moment, together with the staff . Kamari beach is 200 m from the apartments and other nice beaches like Perivolos are around 20 min drive. Worth a stay for sure! We arrived early and the property manager, Maria welcomed us and allowed us to check in early. We were greeted by the owner, Demetrios and they treated us like we were family. We enjoyed the personal jacuzzi very much also. One of our top picks in Kamari – and a guest favorite. 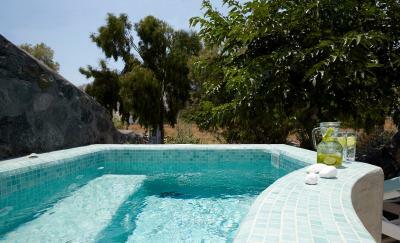 Amara Suites Santorini is located in Kamari, 1,000 feet from Kamari Beach and 9.3 mi from White Beach. Free WiFi is offered and free private parking is available on site. Every room at this guest house is air conditioned and features a flat-screen TV. You will find a coffee machine in the room. Extras include slippers and free toiletries. The nearest airport is Santorini (Thira) Airport, 3.1 mi from the property. 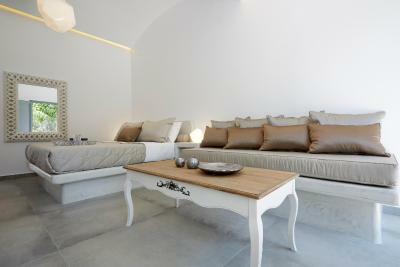 When would you like to stay at Amara Suites Santorini? 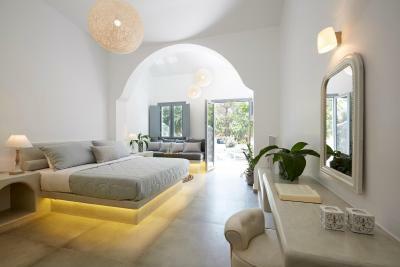 House Rules Amara Suites Santorini takes special requests – add in the next step! 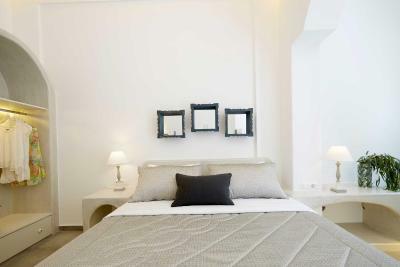 Amara Suites Santorini accepts these cards and reserves the right to temporarily hold an amount prior to arrival. Guests are kindly requested to provide the flight number and the time of arrival. 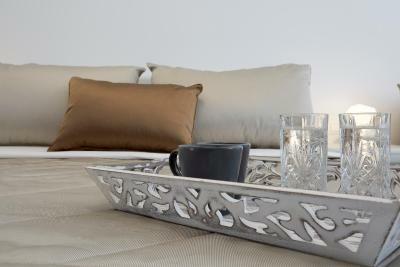 Please inform Amara Suites Santorini of your expected arrival time in advance. You can use the Special Requests box when booking, or contact the property directly using the contact details in your confirmation. Probably one of my all time favorite stays anywhere. Dimitri and Maria really know how to be great hosts, Dimitri is definitely the best host we’ve ever had in our lives. 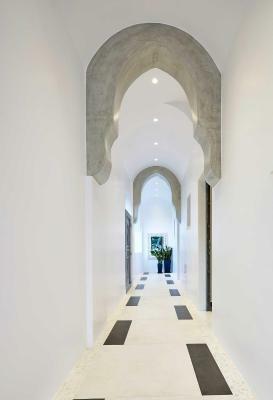 The facility is fresh, clean, modern, spacious, etc. It’s located on Kamari beach which not as famous as Fira / Thira or Oia, but to be honest, we think it’s a better place to visit. The other areas are wayyyy too busy. But the communication with Dimitri is great, he responds to all my questions / requests within an hour, even at odd hours during the night. The room was great, I will recommend this place to whoever I encounter with. Dimitri also has a restaurant on the beach boardwalk, they have access to the beach and beds / umbrellas already setup, free to use. The restaurant is great, probably the best place we ate in Greece, we ate there twice. Couple ways to get here that we took, one was a cab from the airport for $20 euro, the other was a bus (stop about 200 yards away) which costs $1.8 per and will take you to Fira, then another $1.8 to Oia. I think there is free breakfast but we woke up around noon each day so we basically elected to eat lunch instead. Looking forward to your 2019 expansion and even more facilities. Probably some gluten-free and dairy-free options for breakfast, I was limited to bacon and eggs every morning, though that isn't a complaint as the bacon and eggs plus fruit, pastries etc, was great. But we're in Greece so you have to expect there to be a lot of dairy, you can't be mad at it really because if you want that, I would opt for somewhere else that has that in variety. We really loved the suite overall, beautifully decorated and also clean. Had everything you needed from hair dryer (which we forgot), to ironing board that we didn't need to use. No young children screaming! Love that it's not a family destination. Especially as I was turning 26 and with my mother, we enjoyed the setting with adults and couples. I actually enjoy vacations like this at the moment, it's really important to be able to spend time relaxing and not have extra noise. And yes, noise - because that's what kids make haha. It's close to everything and to get to the famous view of Oia is so simple! We did so much and had such great fun. Plus the prices are very similar to the UK so you're not really spending more here. It's like 1.80 in euros ach on a bus to Fira then another 1.80 euros from Fira to Oia. The staff and people are lovely, it's nice to see people from an array of nationalities respect the countries they go to which is something I observe whenever I travel. It really does kill the vibe when you come across people that don't respect the culture and the place they're in. So it was nice to have that the week we were there. We have no considerable suggestions for improvement. Enjoyed every bit of our stay. We enjoyed our stay at Amara Suites very much. My daughter and I had a brilliant time staying in the luxurious Amara Suites. The room was wonderfully spacious, tastefully decorated and contained anything you might need. We were treated like royalty by Dimitri and his team, both at the hotel and at the restaurant where the breakfasts were sumptuous and abundant and our evening meals hearty and delicious. 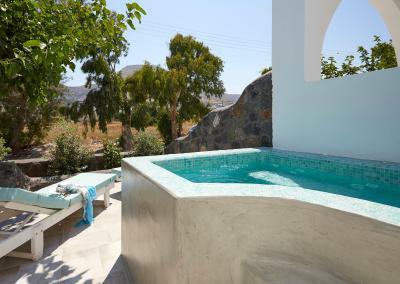 And the private hot tub is a brilliant touch! We loved every minute of our time there! Room was very spacious and comfortable, TV was Netflix ready, staff couldn’t do enough to help, breakfast was enormous. Great having a spa outside, always fresh coffee in the room for the morning. Close to the beach and Main Street in Kamari but far enough out to feel quieter. Owner and staff were great. Would definitely go back if we get a chance. Honestly there is nothing to fault about this property. The property is absolutely beautiful. All the staff offered an excellent service and were very friendly. Dimitris was very warm and welcoming. The room was thoroughly cleaned daily. Breakfast was amazing with different varieties. We also got discount anytime we ate at the Family Restaurant owned by Dimitris. It was nice to have breakfast on the beach with fresh breeze. I would recommend this hotel to anyone seeking a hotel in Santorini that is elegant, private and with exceptional service.